Then, last week, I mentioned on Facebook that I was ripping a Deep Purple record. I didn’t mention which one. Even so, that unleashed a flood of fond memories from other friends, most of whom grew up in the ’70s as I did. “Burn? Stormbringer? Come Taste the Band? one asked. “I know every word on ‘Machine Head.’ Proud of it, too!” my friend eagerly confessed. Now there is a rock chick for you. We went to high school together. “Made in Japan?” another asked. The one I ripped is the one with “Woman From Tokyo” on it. I’ve had Deep Purple’s “Who Do We Think We Are” for almost 40 years. I hadn’t listened to it for a long time, but I still knew almost every line. In the early ’70s, I didn’t have a lot of records, so I played it a lot. It’s part of my DNA, too. “Woman From Tokyo” (spelled “Woman From Tokayo” on the album jacket) was the single and probably is the only cut anyone remembers off this record. So tonight on The Midnight Tracker, that side of that record emerges from the sweet blue haze of time. Turns out this record remembered so vividly was something of an afterthought. In the latter part of 1972, a worn-out Deep Purple was hurled into studios in Rome and Frankfurt after a year and a half of touring. They slammed out this LP, which has only seven cuts. It was released in January 1973, during my sophomore year in high school. This is the first Deep Purple lineup I knew — Jon Lord on keyboards, Ritchie Blackmore on guitar, Ian Gillan on vocals, Roger Glover on bass and Ian Paice on drums — so to me, it’s the classic lineup. They’re all great, even if this record apparently wasn’t. Gillan, who was unhappy with the band’s direction at the time, recorded most of his vocals after the others had done the backing tracks. 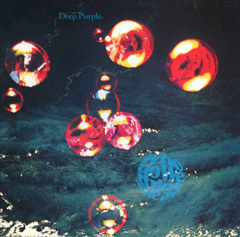 He quit Deep Purple for a decade after this record came out.